For a station in Taiwan, see Houyi Station. 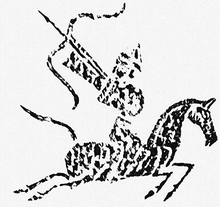 Houyi (后羿), formerly romanized as Hou-i, was a mythological Chinese archer. He was also known as Shenyi and simply as Yi (羿). He is sometimes portrayed as a god of archery descended from heaven to aid mankind. His wife, Chang'e, was a lunar deity. In Chinese mythology, the sun is sometimes symbolized as a three-legged crow called a sunbird. There were ten of these sunbirds, each of whom are the offspring of Di Jun, God of the Eastern Heaven. The ten sunbirds resided in a mulberry tree in the Eastern Sea; each day one would travel around the world on a carriage, driven by Xihe, Mother of the Suns. Eventually, the sunbirds grew tired of the routine and decided that all of them were to rise at the same time. The heat on earth became intense. As a result, crops shriveled in the fields. Lakes and ponds dried up. Human and non-human animals cowered in shelters or collapsed from exhaustion. Time passed and the suffering continued. Emperor Yao decided to plead for divine intervention and to ask Di Jun for aid. Di Jun was well aware of his sons' misdeeds and sent for Houyi, the God of Archery, to teach his sons a lesson. Di Jun wanted Houyi to simply frighten them so that they would not dare to cause mischief again. Houyi, too, wanted to settle this crisis peacefully, but a single glance at the scorched land was enough to convince him that desperate measures were needed. Angered by the suffering of the people caused by the Sun-birds' misconduct, Houyi lifted up his bow and shot them down one by one. Upon killing the ninth, Emperor Yao hurried to halt him as killing the last one would leave the world in total darkness. Houyi agreed and was hailed as a hero for mankind, but later, Houyi's actions caused him to make enemies in Heaven and as a result he was punished with divine wrath. In an alternative version, Houyi attempted to settle the problem peacefully by simply frightening the Sun-birds, but approaching the Sun-birds and threatening them with the arrows, but the sun-birds laughed at him and said he wouldn't dare shoot them, knowing that their father would not kill them. Angered by this Houyi took aim and shot one of the suns from the sky. Houyi realised he had acted out of anger and knew he was in trouble with Di Jun, but reasoned that since he had already begun the task he might as well finish it and shot the remaining suns out of the sky one-by-one, but before he could shoot the last sun the Emperor came to stop him reminding him the world needed the sun. From that day the remaining sun-bird now scared by Houyi, always did his duty and behaved well, always rising and setting on time. Although Yao was pleased with Houyi, Dijun was not happy. Yi had killed nine of the Sun-birds, nine of his errant children, instead of merely bringing them to heel as Dijun wished. 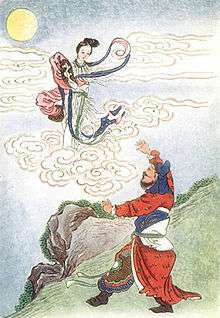 As a father, Dijun could not forgive Yi, so he decided to punish him by banishing the hero from the heavens and stripping him of his immortality. He thought that if Houyi cared so much for the mortals, he could live as one. Houyi then set off on a series of epic adventures to save China. First he had to deal with Fei Lian, Count of the Winds, who created storms that swept across the Middle Kingdom, uprooting crops and tearing down houses. Fei Lian is a fearsome spirit who generally took the form of a one-eyed bull with the tail of a serpent; he resides in Mount Tai. Using his power to travel on the wind, he tracked the gales back to the Demon's habitat. Noticing that the Divine Archer was on his way, Fei Lian hid in a sack. When Houyi entered the monster's cave, he saw through the Demon's subterfuge, and fired an arrow at it, which burst the sack right open. Fei Lian attempted to run but Houyi quickly struck the Demon on his knee. Wounded, Fei Lian surrendered and promised not to stir up trouble again. During his crusade, Houyi happened to come upon a river that had burst its banks. Houyi knew that this must be the doings of a turbulent water god, so he shot an arrow at random into the water. Soon the flood receded and a white-garbed figure on a white horse with several attendants surfaced upon the water. Instantly, Houyi attacked him, wounding him in the eye. The god then fled, leaving his companions behind. Next, Houyi took aim at the nearest figure but when he was about to fire, he noticed his target was a harmless girl. He swung his bow so that the arrow whistled harmlessly through her hair. The girl was Chang'e, the daughter of the water god that had fled. Houyi, stunned by her unearthly beauty, asked her on the spot to be his wife. Chang'e, with great respect for the hero, accepted the proposal. The next threat Houyi had to face was a plague of monsters marauding and destroying the world. Among them was Chilseltooth, a fearsome giant with a single huge incisor protruding from the top of his mouth which he used to rend his victims' flesh. In addition, a monstrous water serpent (see Bashe) was disrupting the calm of Lake Dongting, and the giant Peng bird caused storms merely by flapping its wings. Houyi managed to fend off these menaces one after the other. For Houyi's service to the human realm, Emperor Yao bestowed on him the title of Marquis Pacifier of the Country. Although Houyi cared little about being banished from Heaven, he couldn't bear the fact that he would one day die and become nothing. Searching for a way to regain his immortality, he traveled to the palace of Xi Wang Mu, the Queen Mother of the West, on the Kunlun Mountain, seeking her elixir of immortality. The stories of the great hero Houyi were known to the goddess and she took pity on him and agreed to give him the elixir, but with one condition: knowing that Houyi was a skilled architect, she asked him to build her a summer palace in exchange for the immortality drug. He agreed and for many months he laboured and earned it. Before departing, Xi Wang Mu warned Houyi that the two elixirs she had given him were the last of their kinds. Houyi planned to spend them on himself and his wife. Houyi helplessly sees his wife flying off to the moon. When Houyi returned to his home, he found that Emperor Yao had urgent requests for him, and he made haste to respond. Houyi made a vital mistake by not taking the elixir immediately, and leaving them unguarded. While Houyi was vanquishing humanity's foes, including giant boars, dragons, and other monsters (including the giant Chiseltooth and a monstrous sea serpent,) his wife stayed at home, and for months, he had no news of home. In her boredom, Chang'e found the elixirs that her husband had left behind; out of curiosity, she drank them both. At this moment, Houyi returned and to his surprise found his wife ascending to the moon. Houyi heard his wife's cry for help and tried to seize her, but she was already beyond his reach. Chang'e would gain immortality and forever lived alone on the moon with only white hares accompanying her. According to some folklore, these rabbits pour the elixir of life for her; in others, particularly Japanese and Korean retellings, these rabbits do nothing but make rice cakes. The grief of the loss of his wife changed Houyi completely. He became violent and changed from a hero welcomed by the mortals to being hated as a tyrant. Houyi had taught mortals the ways of using the bow and had a prized student called Feng Meng. Feng Meng's archery skills had blossomed under Houyi's tutelage and soon he saw himself as worthy of comparison with Houyi. One day, Feng Meng challenged him to a shooting contest. Houyi easily beat him which convinced Feng Meng that, despite his amazing marksmanship, there was no way he could catch up to his master. Blinded by jealousy, Feng Meng decided to murder his teacher. To him, it was entirely justified as Houyi was no longer an honorable hero but a tyrant. One day during a hunt, he attacked him, striking him on the back with a club made from the wood of a peach tree. Along with others that were angry at Houyi, Feng Meng beat Houyi to death. Although these men were to be brought to justice, the epic of Houyi finally came to a bitter end. Later, the spirit of Houyi ascended to the sun and built a palace. So Chang'e and Houyi came to represent the yin and yang, the moon and the sun. The tale was depicted in the music video of Australian rock band Powderfinger's 2003 hit, "Sunsets". Mid-Autumn Festival#Stories of the Mid-Autumn Festival for variants of this legend. ↑ Sarah Allan (1991). 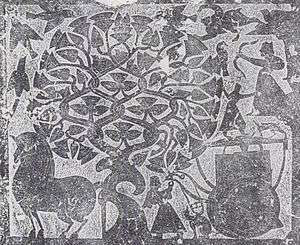 The shape of the turtle: myth, art, and cosmos in early China. SUNY Press. pp. 30–31. ISBN 0-7914-0460-9. Goddesses Heroes and Shamans by Scholastic inc., 1994. Littleton, C. Scott. Mythology: The Illustrated Anthology of World Myth and Storytelling. Duncan Baird Publishers, London, 2002.